Manganese(III) oxide is a chemical compound with the formula Mn2O3. Heating MnO2 in air at below 800 °C produces α-Mn2O3 (higher temperatures produce Mn3O4). γ-Mn2O3 can be produced by oxidation followed by dehydration of manganese(II) hydroxide. Many preparations of nano-crystalline Mn2O3 have been reported, for example syntheses involving oxidation of MnII salts or reduction of MnO2. Manganese (III) oxide Mn2O3 must not be confused with MnOOH manganese (III) oxyhydroxide. Contrary to Mn2O3, MnOOH is a compound that decomposes at about 300 °C to form MnO2. Mn2O3 is unlike many other transition metal oxides in that it does not adopt the corundum (Al2O3) structure. Two forms are generally recognized, α-Mn2O3 and γ-Mn2O3, although a high pressure form with the CaIrO3 structure has been reported too. γ-Mn2O3 has a structure related to the spinel structure of Mn3O4 where the oxide ions are cubic close packed. This is similar to the relationship between γ-Fe2O3 and Fe3O4. γ-Mn2O3 is ferrimagnetic with a Néel temperature of 39 K.
^ Otto H.H. ; Baltrasch R.; Brandt H.J. (1993). "Further evidence for Tl3+ in Tl-based superconductors from improved bond strength parameters involving new structural data of cubic Tl2O3". Physica C. 215: 205. doi:10.1016/0921-4534(93)90382-Z. ^ a b c Greenwood, Norman N.; Earnshaw, Alan (1997). Chemistry of the Elements (2nd ed.). Butterworth-Heinemann. p. 1049. ISBN 978-0-08-037941-8. ^ Shuijin Lei; Kaibin Tang; Zhen Fang; Qiangchun Liu; Huagui Zheng (2006). "Preparation of α-Mn2O3 and MnO from thermal decomposition of MnCO3 and control of morphology". Materials Letters. 60: 53. doi:10.1016/j.matlet.2005.07.070. ^ Zhong-Yong Yuan; Tie-Zhen Ren; Gaohui Du; Bao-Lian Su (2004). "A facile preparation of single-crystalline α-Mn2O3 nanorods by ammonia-hydrothermal treatment of MnO2". Chemical Physics Letters. 389: 83. doi:10.1016/j.cplett.2004.03.064. ^ Navin Chandra; Sanjeev Bhasin; Meenakshi Sharma; Deepti Pal (2007). "A room temperature process for making Mn2O3 nano-particles and γ-MnOOH nano-rods". Materials Letters. 61 (17): 3728. doi:10.1016/j.matlet.2006.12.024. ^ Thomas Kohler; Thomas Armbruster; Eugen Libowitzky (1997). "Hydrogen Bonding and Jahn-Teller Distortion in Groutite,α-MnOOH, and Manganite,γ-MnOOH, and Their Relations to the Manganese Dioxides Ramsdellite and Pyrolusite". Journal of Solid State Chemistry. 133 (2): 486–500. doi:10.1006/jssc.1997.7516. ^ Geller S. (1971). 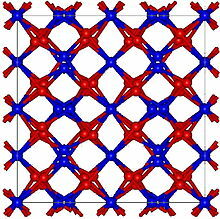 "Structure of α-Mn2O3, (Mn0.983Fe0.017)2O3 and (Mn0.37Fe0.63)2O3 and relation to magnetic ordering". Acta Crystallogr B. 27 (4): 821. doi:10.1107/S0567740871002966. ^ Geller S. (1970). "Magnetic and Crystallographic Transitions in Sc+, Cr+, and Ga+ Substituted Mn2O3". Physical Review B. 1: 3763. ^ Kim S. H; Choi B. J; Lee G.H. ; Oh S. J.; Kim B.; Choi H. C.; Park J; Chang Y. (2005). "Ferrimagnetism in γ-Manganese Sesquioxide (γ−Mn2O3) Nanoparticles". Journal of the Korean Physical Society. 46 (4): 941. This page was last edited on 21 November 2018, at 19:24 (UTC).